The Gelug tradition of Tibetan Buddhism was founded by Lama Tsongkhapa in the early 14th century. This tradition strongly emphasized the monastic system as a basis for the study and practice of Lord ShakyaMuni Buddha’s teachings of Sutra and Tantra. 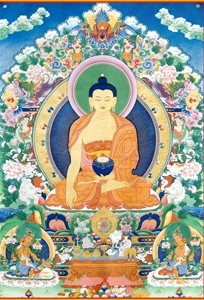 Lama Tsongkhapa founded the Gelug tradition not too long after Acharya Dipamkara Shrijnana or Palden Atisha, the great Indian Buddhist master visited Tibet in the early 11th century. Atisha went to Tibet at the invitation of Lha-Lama Yeshi Woe and his nephew Jangchub Woe. He was invited to Tibet to restore the purity of Buddha’s teachings because there was some confusion and corruption in the teachings and practices of Tibetan Buddhism there. Atisha was believed to have lived in Tibet for 17 years. For three years he lived in Ngari of western Tibet, fpr nine years he lived in Nyethang, and fpr five years he lived in the central part of Tibet. He gave extensive teachings on Sutra and Tantra and refined Buddha’s teachings during his stay there. While in Tibet, Atisha wrote a famous book called A Lamp On The Path To Enlightenment as a formal response to the questions raised by the Tibetan masters and scholars. The purpose of the book was in to clarify misinterpretations of the Dharma that were spreading throughout Tibet. A Lamp On The Path To Enlightenment solidifies the very essence of Buddha’s teachings of Sutra and Tantra. Atisha founded the so-called KADAM TRADITION which provided the basis for the reforms of Lama Tsongkhapa in the early 14th century. Atisha had hundreds of disciples in Tibet, but of all of them the most important was Lama Drom Tonpa, who is often said to have been an early incarnation of the Dalai Lamas. It was to Lama Drom that Atisha left most of his lineages, including the Lam Rim lineage that is the subject of the Lam Rim Chenmo, The Great Exposition On The Stages Of The Path To Enlightenment by Lama Tsongkhapa. Lama Drom Tonpa divided the tradition into three lines of transmission, and these were not to be reunited for three hundred years. Then in the 14th century Lama Tsongkhapa, root Guru of the First Dalai Lama, united the fragmented lineages. Since then, the complete tradition has always been passed on intact. Using Kadam as the foundation, Lama Tsongkhapa established the Gaden Namper Gyal wey Ling, the monastic based university for the study of Buddha’s teachings of Sutra and Tantra. Later, two of his chief disciples founded two other monastic universities: Drepung and Sera. Drepung and Sera monasteries ended up becoming more popular and reknown than Gaden because of their academic study, and because they produced a greater number of scholars than Gaden Monastery. Gaden, Drepung, and Sera monasteries were the most important academic seats for the study and practice of the Gelug tradition of Tibetan Buddhism in Tibet and are also the most important academic seats in India today. The Gelug tradition of Tibetan Buddhism can be traced back to Atisha, and Atisha’s teaching lineage can be traced back to Shakyamuni Buddha, the founder of Buddhism. The Gelug tradition stresses the importance of the observation of the Vinaya as a primary base for the practices of Sutra and Tantra. For this reason, the Gelug put a lot of emphasis on monasticism where monks and nuns strictly observe the Vinaya ethical codes. The Gelug tradition addresses the importance of a strong monastic-based academic study of the five major Buddhist philosophies. They emphasize this in order to gain a full and complete understanding of the Sutric and Tantric teachings of Buddha before putting them into actual practice, or before sitting in the JADREL, which is the life-long solitude retreat. The Gelug tradition also stresses the importance of having a strong Sutric foundation in order to study and practice Tantra. Practicing Tantric without having a strong Sutric foundation would be as if someone were flying a plane and attempting to take-off without an available run-way: it would only end in disaster. And to make a mindful effort in every moment to follow him well with the irreversible feeling of devotion, trust, respect and humility. Gaden Tripa is the supreme head of the Gelug tradition of Tibetan Buddhism since he is the throne holder of Lama Tsongkhapa. His Holiness the Dalai Lama is regarded as the spiritual head of all four traditions of Tibetan Buddhism: Nyingma, Kagyu, Sakya, and Gelug. His Holiness the Dalai Lama himself holds the Gelug tradition of teachings and practice. In summary, the Gelug tradition of Tibetan Buddhism is the most refined Tibetan Buddhist sect, founded by Lama Tsongkhapa and based on the Kadam tradition which was founded by Atisha in the 11th century.